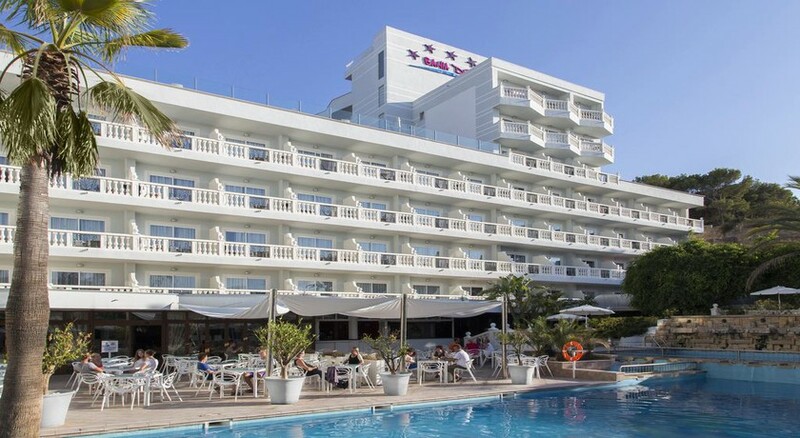 The 4-star Hotel Bahia del Sol is located in Santa Ponsa Bay and is just a short walk from the white sandy beaches of this wonderful resort. The 4-star hotel provides guests with the chance to relax and explore in equal measure, and its classic and contemporary style throughout means comfort is never far away. The hotel’s 209 guest rooms and suites make for a superb stay, each complete with a balcony that overlooks the sea. Hotel Bahia del Sol features a host of first-class facilities including a Spa, outdoor swimming pool and an excellent themed buffet restaurant, where guests can explore the huge choice of cuisine on offer. The surrounding area offers shops, bars and restaurants, ensuring that there is something for everyone. 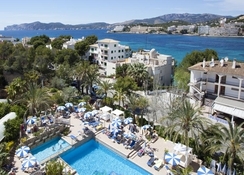 Hotel Bahia del Sol is just 30km from Palma de Mallorca Airport, too. The hotel is perfectly located in the resort of Santa Ponsa, just 200m away from the nearest sandy beach, Santa Ponsa Bay. Here guests can either choose to soak up the sun or they can go wild with the array of watersports on offer. For guests who like to explore their surroundings, a quick stroll into Santa Ponsa will provide them with the chance to try traditional restaurants, sample local spirits and immerse themselves in this beautiful resort. The airport is a short drive away as well as water parks and golf courses. The 209 rooms at Hotel Bahia Del Sol allow guests to sample 4-star luxury. They are spread over two blocks and eight floors, all of which feature modern décor while offering plenty of space and relevant amenities. Standard and Double Rooms are available and each have balconies, with some serving up views of the Mediterranean Sea. All of the rooms are equipped with satellite TV, air-conditioning, minibar, safety box, terrace, hairdryer and telephone. The Family Rooms come with twin beds and a sofa bed, but all rooms guarantee a touch of luxury and real comfort. Bahia Del Sol Santa Ponsa is the hotel’s large restaurant, which provides guests with access to delicious dishes throughout the day. The main restaurant offers regional and international specialities, with show cooking each day and themed nights available. Every Saturday there is a gala buffet, ensuring plenty of choice. The restaurant serves breakfast, lunch and dinner amid a vibrant atmosphere, and the bar serves a huge selection of alcoholic beverage and soft drinks, ensuring that adults and kids have plenty to choose from. The Hotel Bahia del Sol has a trick up its sleeve with a Spa and Wellness centre, where guests can relax and unwind while leaving the beautiful sunshine behind for a while. There is a gym where guests can work up a sweat before retreating to the heated pool whirlpool and sauna to take things a little easier. Massage treatments are also available upon request. For those who prefer some action, there is a pool table, table tennis and entertainment throughout the day and the evening including a kids’ club. If guests want to explore Santa Ponsa then they can hire bikes and head off on an adventure. An amazing hotel, look and services and a very helpful staff + delicious food !! Thank you for the great hospitality!!! I stayed for a week in February, so the hotel was quiet when I got there with not many guest. The spas and indoor pool were a godsend because it was to cold and wet to venture outside a lot of the time. The room was very nice and cleaned every day. The food was to die for! I’ve never eaten so well. Always a huge variety of top quality food, I was spoilt for choice every night. The staff were super. Very friendly and helpful. Lovely hotel and very good value for a short break. Our room was very hard to find with a brick wall view of the balcony ,when we first arrived the receptionist said this is a respectable hotel don’t make me phone the police. All we was doing was talking,the food was good but seems like they cater for Germans and other Europeans not so much for English, the bar staff and entertainment staff was friendly. The area around the hotel was clean and friendly felt more relaxed out of the hotel. Lovely hotel pleasent staff. Not keen on the outside and indoor pool too deep. Food not to our liking. Desserts were great.